Bamburgh Castle is set in a spectacular location right on the beach at Bamburgh in Northumberland. This is a favourite location for photographers, and being positioned on the East Coast, it is ideally placed for sunrise photos, with the classic view being from the rocky beach to the north of the castle. 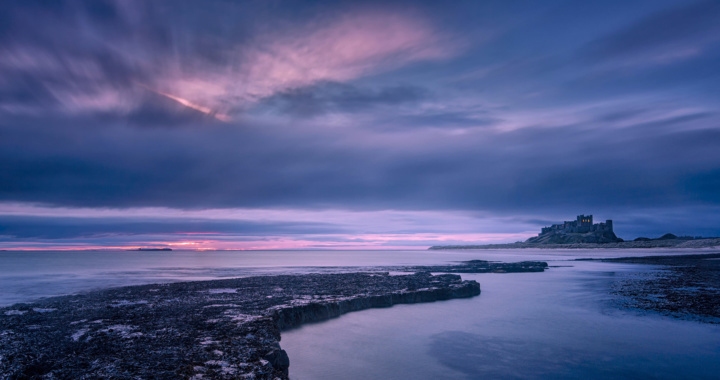 There has been a fort or castle at Bamburgh since at least the 5th century when it was a stronghold of the Britons and later the Anglo Saxon kingdom of Bernicia. Following the Norman conquest, a Norman keep was built on the location which was subsequently expanded during the Middle Ages as various curtain walls and other buildings were added. The castle deteriorated after the 15th century, but was later restored during the 18th and 19th centuries. Bamburgh can be reached by turning off the A1, either along the B1341 or B1342. The roads merge as the village of Bamburgh is reached. On arriving in the centre of Bamburgh, with the castle rearing up ahead, turn right down a road called The Wynding. A short distance along this road is a car park which gives access to the beach, however by continuing a few hundred metres further along the road there are some parking spaces which are just above the rocky part of the beach. This gives the best early morning views of the castle. This is a popular spot for photographers – on a Monday morning in March, we were surprised to find about a dozen other photographers also set up taking photographs from the rocks.